For other uses, see Domesday (disambiguation). It was written in Medieval Latin, was highly abbreviated, and included some vernacular native terms without Latin equivalents. The survey's main purpose was to determine what taxes had been owed during the reign of King Edward the Confessor, which allowed William to reassert the rights of the Crown and assess where power lay after a wholesale redistribution of land following the Norman conquest. for as the sentence of that strict and terrible last account cannot be evaded by any skilful subterfuge, so when this book is appealed to ... its sentence cannot be quashed or set aside with impunity. That is why we have called the book "the Book of Judgement" ... because its decisions, like those of the Last Judgement, are unalterable. The manuscript is held at The National Archives at Kew, London. In 2011, the Open Domesday site made the manuscript available online. Domesday Book encompasses two independent works (in, originally, two physical volumes). These were "Little Domesday" (covering Norfolk, Suffolk, and Essex), and "Great Domesday" (covering much of the remainder of England‍—‌except for lands in the north which later became Westmorland, Cumberland, Northumberland, and the County Palatine of Durham‍—‌and parts of Wales bordering, and included within, English counties.) No surveys were made of the City of London, Winchester, or some other towns, probably due to their tax-exempt status. (Other areas of modern London were then in Middlesex, Kent, Essex, etc., and are included in Domesday Book.) Most of Cumberland and Westmorland are missing. County Durham is missing because the Bishop of Durham (William de St-Calais) had the exclusive right to tax it; in addition, parts of north-east England were covered by the 1183 Boldon Book, listing areas liable to tax by the Bishop of Durham. The omission of the other counties and towns is not fully explained, although in particular Cumberland and Westmorland had yet to be fully conquered. "Little Domesday" – so named because its format is physically smaller than its companion's – is the more detailed survey, down to numbers of livestock. It may have represented the first attempt, resulting in a decision to avoid such level of detail in "Great Domesday". Both volumes are organised into a series of chapters (literally "headings", from Latin caput, "a head") listing the fees (knight's fees or fiefs, broadly identical to manors), held by a named tenant-in-chief of the king (who formed the highest stratum of Norman feudal society below the king), namely religious institutions, Bishops, Norman warrior magnates and a few Saxon thegns who had made peace with the Norman regime. Some of the largest such magnates held several hundred fees, in a few cases in more than one county. For example, the chapter of the Domesday Book Devonshire section concerning Baldwin the Sheriff lists 176 holdings held in-chief by him. Only a few of the holdings of the large magnates were held in demesne, most having been subinfeudated to knights, generally military followers of the tenant-in-chief (often his feudal tenants from Normandy) which latter thus became their overlord. The fees listed within the chapter concerning a particular tenant-in-chief were usually ordered, but not in a systematic or rigorous fashion, by the Hundred Court under the jurisdiction of which they were situated, not by geographic location. As a review of taxes owed, it was highly unpopular. HIC ANNOTANTUR TENENTES TERRAS IN DEVENESCIRE ("Here are noted (those) holding lands in Devonshire"). Detail from Domesday Book, list forming part of the first page of king's holdings. There are 53 entries, including the first entry for the king himself followed by the Devon Domesday Book tenants-in-chief. Each name has its own chapter to follow. Each county's list opened with the king's demesne lands (which had possibly been the subject of separate inquiry). It should be borne in mind that under the feudal system the king was the only true "owner" of land in England, under his allodial title. He was thus the ultimate overlord and even the greatest magnate could do no more than "hold" land from him as a tenant (from the Latin verb tenere, "to hold") under one of the various contracts of feudal land tenure. Holdings of Bishops followed, then of the abbeys and religious houses, then of lay tenants-in-chief and lastly the king's serjeants (servientes), and Saxon thegns who had survived the Conquest, all in hierarchical order. In some counties, one or more principal towns formed the subject of a separate section: in some the clamores (disputed titles to land) were also treated separately. This principle applies more especially to the larger volume: in the smaller one, the system is more confused, the execution less perfect. Domesday names a total of 13,418 places. Apart from the wholly rural portions, which constitute its bulk, Domesday contains entries of interest concerning most of the towns, which were probably made because of their bearing on the fiscal rights of the crown therein. These include fragments of custumals (older customary agreements), records of the military service due, of markets, mints, and so forth. From the towns, from the counties as wholes, and from many of its ancient lordships, the crown was entitled to archaic dues in kind, such as honey. In a parallel development, around 1100 the Normans in southern Italy completed their Catalogus Baronum based on Domesday Book. The manuscripts do not carry a formal title. The work is referred to internally as a descriptio (enrolling), and in other early administrative contexts as the king's brevia (writings). From about 1100, references appear to the liber (book) or carta (charter) of Winchester, its usual place of custody; and from the mid-12th to early 13th centuries, to the Winchester or king's rotulus (roll). The book is metaphorically called by the native English, Domesday, i.e., the Day of Judgement. For as the sentence of that strict and terrible last account cannot be evaded by any skilful subterfuge, so when this book is appealed to on those matters which it contains, its sentence cannot be quashed or set aside with impunity. That is why we have called the book "the Book of Judgement", ... not because it contains decisions on various difficult points, but because its decisions, like those of the Last Judgement, are unalterable. Either through false etymology or deliberate word play, the name also came to be associated with the Latin phrase Domus Dei ("House of God"). Such a reference is found as early as the late 13th century, in the writings of Adam of Damerham; and in the 16th and 17th centuries, antiquaries such as John Stow and Sir Richard Baker believed this was the name's origin, alluding to the church in Winchester in which the book had been kept. As a result, the alternative spelling "Domesdei" became popular for a while. The Anglo-Saxon Chronicle states that planning for the survey was conducted in 1085, and the book's colophon states the survey was completed in 1086. It is not known when exactly Domesday Book was compiled, but the entire copy of Great Domesday appears to have been copied out by one person on parchment (prepared sheepskin), although six scribes seem to have been used for Little Domesday. Writing in 2000, David Roffe argued that the inquest (survey) and the construction of the book were two distinct exercises. He believes the latter was completed, if not started, by William II following his assumption of the English throne; William II quashed a rebellion that followed and was based on, though not consequent on, the findings of the inquest. Most shires were visited by a group of royal officers (legati), who held a public inquiry, probably in the great assembly known as the shire court. These were attended by representatives of every township as well as of the local lords. The unit of inquiry was the Hundred (a subdivision of the county, which then was an administrative entity). The return for each Hundred was sworn to by 12 local jurors, half of them English and half of them Norman. What is believed to be a full transcript of these original returns is preserved for several of the Cambridgeshire Hundreds – the Cambridge Inquisition – and is of great illustrative importance. The Inquisitio Eliensis is a record of the lands of Ely Abbey. The Exon Domesday (named because the volume was held at Exeter) covers Cornwall, Devon, Dorset, Somerset, and one manor of Wiltshire. Parts of Devon, Dorset, and Somerset are also missing. Otherwise, this contains the full details supplied by the original returns. After this had the king a large meeting, and very deep consultation with his council, about this land; how it was occupied, and by what sort of men. Then sent he his men over all England into each shire; commissioning them to find out 'How many hundreds of hides were in the shire, what land the king himself had, and what stock upon the land; or, what dues he ought to have by the year from the shire.' Also he commissioned them to record in writing, 'How much land his archbishops had, and his diocesan bishops, and his abbots, and his earls;' and though I may be prolix and tedious, 'What, or how much, each man had, who was an occupier of land in England, either in land or in stock, and how much money it was worth.' So very narrowly, indeed, did he commission them to trace it out, that there was not one single hide, nor a yard of land, nay, moreover (it is shameful to tell, though he thought it no shame to do it), not even an ox, nor a cow, nor a swine was there left, that was not set down in his writ. And all the recorded particulars were afterwards brought to him. The list of questions asked of the jurors was recorded in the Inquisitio Eliensis. After a great political convulsion such as the Norman conquest, and the following wholesale confiscation of landed estates, William needed to reassert that the rights of the Crown, which he claimed to have inherited, had not suffered in the process. His Norman followers tended to evade the liabilities of their English predecessors. The successful trial of Odo de Bayeux at Penenden Heath near Maidstone in Kent less than a decade after the conquest was one example of the Crown's growing discontent at the Norman land-grab of the years following the invasion. Historians believe the survey was to aid William in establishing certainty and a definitive reference point as to property holdings across the nation, in case such evidence was needed in disputes over Crown ownership. The Domesday survey, therefore, recorded the names of the new holders of lands and the assessments on which their tax was to be paid. But it did more than this; by the king's instructions, it endeavoured to make a national valuation list, estimating the annual value of all the land in the country, (1) at the time of Edward the Confessor's death, (2) when the new owners received it, (3) at the time of the survey, and further, it reckoned, by command, the potential value as well. It is evident that William desired to know the financial resources of his kingdom, and it is probable that he wished to compare them with the existing assessment, which was one of considerable antiquity, though there are traces that it had been occasionally modified. The great bulk of Domesday Book is devoted to the somewhat arid details of the assessment and valuation of rural estates, which were as yet the only important source of national wealth. After stating the assessment of the manor, the record sets forth the amount of arable land, and the number of plough teams (each reckoned at eight oxen) available for working it, with the additional number (if any) that might be employed; then the river-meadows, woodland, pasture, fisheries (i.e. fishing weirs), water-mills, salt-pans (if by the sea) and other subsidiary sources of revenue; the peasants are enumerated in their several classes; and finally the annual value of the whole, past and present, is roughly estimated. The organisation of the returns on a feudal basis, enabled the Conqueror and his officers to see the extent of a baron's possessions; and it also showed to what extent he had under-tenants and the identities of the under-tenants. This was of great importance to William, not only for military reasons but also because of his resolve to command the personal loyalty of the under-tenants (though the "men" of their lords) by making them swear allegiance to himself. As Domesday Book normally records only the Christian name of an under-tenant, it is not possible to search for the surnames of families claiming a Norman origin. Scholars, however, have worked to identify the under-tenants, most of whom have foreign Christian names. Domesday Book was preserved from the late 11th to the beginning of the 13th centuries in the royal Treasury at Winchester (the Norman kings' capital). It was often referred to as the "Book" or "Roll" of Winchester. When the Treasury moved to the Palace of Westminster, probably under King John, the book went with it. In the Middle Ages, the Book's evidence was frequently invoked in the law-courts. As recently as the 1960s, it was still referred to in court cases regarding ancient land and property rights. ^ "Domesday Book". Merriam-Webster Online. ^ a b "The Anglo-Saxon Chronicle". Translated by Giles, J. A.; Ingram, J. Project Gutenberg. 1996. Retrieved 6 November 2016. ^ Emerson, Ralph Waldo & Burkholder, Robert E. (Notes) (1971). The Collected Works of Ralph Waldo Emerson: English Traits. 5. Harvard University Press. p. 250. ^ Johnson, C., ed. (1950). Dialogus de Scaccario, the Course of the Exchequer, and Constitutio Domus Regis, the King's Household. London. p. 64. ^ Cellan-Jones, Rory (13 May 2011). "Domesday Reloaded project: The 1086 version". BBC News. ^ Hoskins, W.G. (1954). A New Survey of England. Devon, London. p. 87. ^ Return of Owners of Land, 1873, Wales, Scotland, Ireland. 1873. Archived from the original on 10 September 2012. Retrieved 15 April 2013. ^ "Hull Domesday Project: Wales". Retrieved 14 February 2019. ^ Palmer, Alan (1976). Kings and Queens of England. Great Britain: Octopus Books Limited. p. 15. ISBN 0706405420. ^ "The Domesday Book". History Magazine. October 2001. Retrieved 24 February 2009. ^ a b Hallam 1986, pp. 34–5. ^ Harvey 2014, pp. 7–9. ^ Harvey 2014, pp. 271–328. ^ Johnson, C., ed. (1950). Dialogus de Scaccario, the Course of the Exchequer, and Constitutio Domus Regis, the King's Household. London. pp. 63–64. ^ Hallam 1986, p. 35. ^ Hallam 1986, p. 34. ^ Harvey 2014, pp. 18–19. ^ "The Domesday Book Online". Retrieved 7 December 2018. ^ Roffe, David (2000). Domesday; The Inquest and The Book. Oxford University Press. pp. 224–249. ^ "Inquisitio Eliensis". Domesday Explorer. Archived from the original on 26 May 2011. Retrieved 24 April 2010. ^ Cooper, Alan (2001). "Extraordinary privilege: the trial of Penenden Heath and the Domesday inquest". English Historical Review. 116 (469): 1167–1192. doi:10.1093/ehr/116.469.1167. ^ Foundation, Internet Memory. "[ARCHIVED CONTENT] UK Government Web Archive – The National Archives". webarchive.nationalarchives.gov.uk. Archived from the original on 2016-01-05. Retrieved 10 January 2017. ^ Hallam 1986, p. 55. ^ Hallam 1986, pp. 55–6. ^ Hallam 1986, pp. 133–4. ^ Hallam 1986, pp. 150–52. ^ Hallam 1986, pp. 155–6. ^ Hallam 1986, pp. 167–9. ^ Cantwell, John D. (1991). The Public Record Office, 1838–1958. London: HMSO. pp. 379, 428–30. ISBN 0114402248. ^ Hallam 1986, pp. 29, 150–51, 157–61, 170–72. ^ Forde, Helen (1986). Domesday Preserved. London: Public Record Office. ISBN 0-11-440203-5. Darby, Henry C. (1977). Domesday England. Cambridge: Cambridge University Press. ISBN 0-521-31026-1. Domesday Book: A Complete Translation. London: Penguin. 2003. ISBN 0-14-143994-7. Hallam, Elizabeth M. (1986). 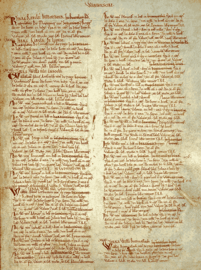 Domesday Book through Nine Centuries. London: Thames & Hudson. ISBN 0500250979. Harvey, Sally (2014). Domesday: Book of Judgement. Oxford: Oxford University Press. ISBN 978-0-19-966978-3. Holt, J. C. (1987). Domesday Studies. Woodbridge, Suffolk: The Boydell Press. ISBN 0-85115-263-5. Keats-Rohan, Katherine S. B. (1999). Domesday People: A Prosopography of Persons Occurring in English Documents, 1066–1166 (2v). Woodbridge, Suffolk: Boydell Press. Lennard, Reginald (1959). Rural England 1086–1135: A Study of Social and Agrarian Conditions. Oxford: Oxford University Press. ISBN 0-19-821272-0. Maitland, F. W. (1988). Domesday Book and Beyond. Cambridge: Cambridge University Press. ISBN 0-521-34918-4. Roffe, David (2000). Domesday: The Inquest and The Book. Oxford: Oxford University Press. ISBN 0-19-820847-2. Roffe, David (2007). Decoding Domesday. Woodbridge, Suffolk: The Boydell Press. ISBN 978-1-84383-307-9. Roffe, David; Keats-Rohan, Katharine (2016). Domesday Now: New Approaches to the Inquest and the Book. Woodbridge, Suffolk: The Boydell Press. ISBN 978-1-78327-088-0. Vinogradoff, Paul (1908). English Society in the Eleventh Century. Oxford: Clarendon Press. Wood, Michael (2005). The Domesday Quest: In Search of the Roots of England. London: BBC Books. ISBN 0-563-52274-7. "Phillimore series", published by Phillimore & Co. Ltd., of Shopwyke Hall, Chichester, Sussex; one pair of volumes or "parts" for each county (Part 1: Latin text and translation; Part 2: notes). Example: Thorn, C. et al. (eds.) (1979) Cornwall. Chichester: Phillimore. Bates, David (1985). A Bibliography of Domesday Book. Woodbridge: Boydell. ISBN 0-85115-433-6. Bridbury, A. R. (1990). "Domesday Book: a re-interpretation". English Historical Review. 105: 284–309. doi:10.1093/ehr/cv.ccccxv.284. Darby, Henry C. (2003). The Domesday Geography of Eastern England. Domesday Geography of England. 1 (revised 3rd ed.). Cambridge: Cambridge University Press. ISBN 0521893968. Darby, Henry C.; Terrett, I. B., eds. (1971). The Domesday Geography of Midland England. Domesday Geography of England. 2 (2nd ed.). Cambridge: Cambridge University Press. ISBN 0521080789. Darby, Henry C.; Campbell, Eila M. J., eds. (1961). The Domesday Geography of South-East England. Domesday Geography of England. 3. Cambridge: Cambridge University Press. ISBN 0521047706. Darby, Henry C.; Maxwell, I. S., eds. (1977). The Domesday Geography of Northern England. Domesday Geography of England. 4 (corrected ed.). Cambridge: Cambridge University Press. ISBN 0521047730. Darby, Henry C.; Finn, R. Welldon, eds. (1979). The Domesday Geography of South West England. Domesday Geography of England. 5 (corrected ed.). Cambridge: Cambridge University Press. ISBN 0521047714. Finn, R. Welldon (1973). Domesday Book: a guide. London: Phillimore. ISBN 0-85033-101-3. Snooks, Graeme D.; McDonald, John (1986). Domesday Economy: a new approach to Anglo-Norman history. Oxford: Clarendon Press. ISBN 0-19-828524-8. Hamshere, J. D. (1987). "Regressing Domesday Book: tax assessments of Domesday England". Economic History Review. n.s. 40: 247–51. doi:10.2307/2596690. Leaver, R. A. (1988). "Five hides in ten counties: a contribution to the Domesday regression debate". Economic History Review. n.s. 41: 525–42. doi:10.2307/2596600. McDonald, John; Snooks, G. D. (1985). "Were the tax assessments of Domesday England artificial? : the case of Essex". Economic History Review. n.s. 38: 352–72. doi:10.2307/2596992. Sawyer, Peter, ed. (1985). Domesday Book: a reassessment. London: Edward Arnold. ISBN 0713164409.